As far as binge-watching benders go, the 12 day Simpsons marathon coming up this August requires some intense training. To get you started, we’ve put together a guide of binge-watch worthy shows, and some insight on how long it might take you to get through them. Keep in mind, the graph shows how long it would take to watch each show nonstop, day and night, with no breaks. If you’re too weak to binge-watch like a champion, by all means, break the viewing up into several weeks. Just want to skip around and watch the best from each season? 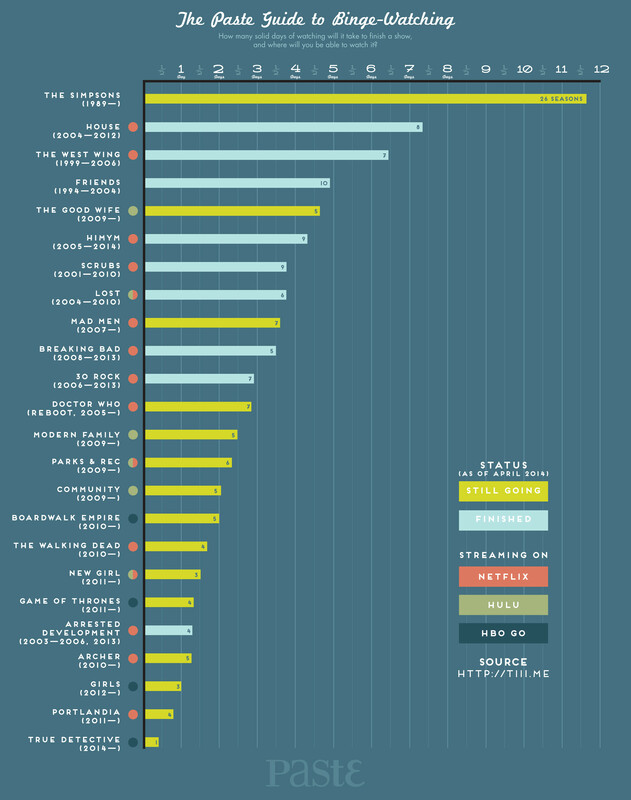 Check out Graph.TV’s visualized ratings of your favorite shows here. Click on the image below to enlarge in a new window. Did we miss your favorite show? Head over to Tii.Me to see more.